During the week, the prospect of a government shutdown was on the collective mind of Wall Street and appeared to limit the market’s gains. Federal spending authorizations were set to expire on Friday evening and congressional officials scrambled to pass a bill to keep the government funded. The prospects of a compromise measure that would attract enough Democratic votes in the Senate fluctuated but seemed to grow dimmer as the week progressed. The House passed a bill along party lines on Thursday, but the trading week ended without any action in the Senate. The Dow Jones Industrials Average was helped by a more than 300-point advance for the Dow Jones Industrials Average on Wednesday and U.S. equity market indexes finished with modest gains for the holiday-shortened week. The Dow Jones Industrial Average traded up +1.08%, S&P 500 returned +0.88% and the MSCI EAFE (developed international) rose +1.25%. U.S. housing starts fell in December by the largest amount in over a year. The steep drop was largely the result of a sizeable decline in single-family housing. In our view, this is not a sign of a housing demand slowdown, but more of a weather and labor supply-driven shortage in a data series that has a decent amount of volatility from month to month. Although December housing starts were disappointing, building permits remain strong. Building permits are a leading indicator for future construction. In December, permits dropped slightly to 1.302 million annualized from 1.303 million annualized in November. 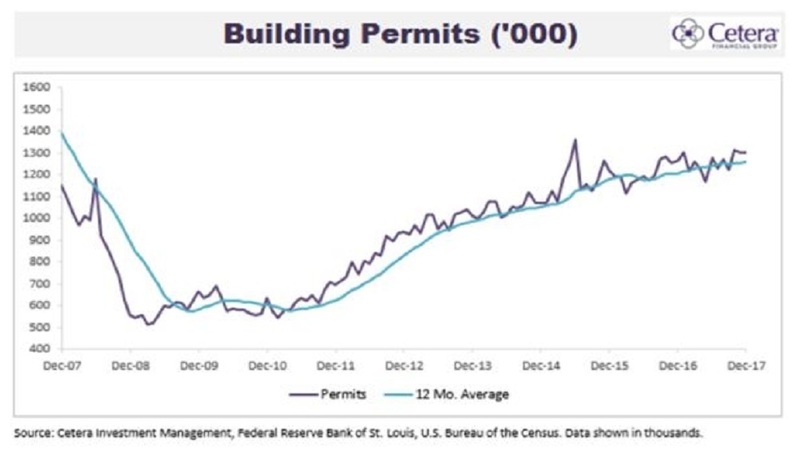 Despite the narrow decline, the trend in building permits remains strong as the 12-month average climbed to its highest level since February 2008. This bodes well for housing construction in 2018.